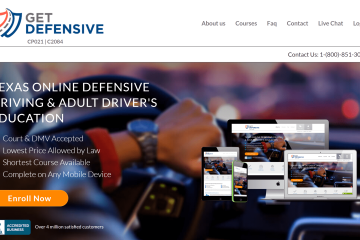 When it comes to world class defensive driving courses, Get Defensive is at the top of the list! 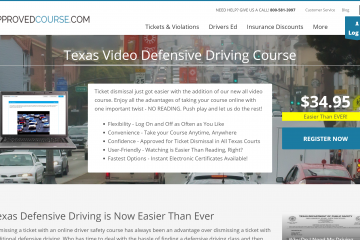 This Texas-based course offers a slew of driver safety courses and services, and it might just be the thing that you need to get a ticket dismissed, get lower prices on your insurance, or even to complete mandatory training if you’re looking to be a truck driver. Not only will this course get you certified, but it is also approved by the Texas Department of Licensing and Registration (TDLR), so you can be sure that your work isn’t wasted with this company! In addition to delivering approved courses, they do it fast since they also offer same day processing for the certificate of completion, as well as an option to have the certificate delivered overnight. 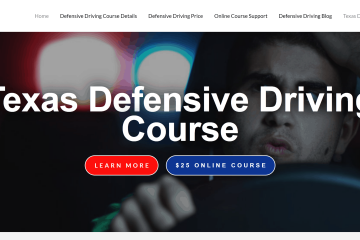 So, if you’ve waited until the last minute to take care of your defensive driving course requirement, then this course is definitely one of the fastest options out there to get you certified and get that ticket out of your sight. 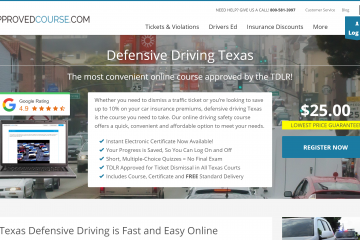 In addition to these courses that they offer online, there are a ton of other helpful features that they offer, such as the ability to start and stop the course whenever you want (which is super helpful since the state of Texas requires the defensive driving course to be a minimum of six hours), adding your driving record to your order instead of having to go through the Texas DMV to get your driving record, a version of the defensive driving course in Spanish, insurance discounts through the defensive driving course or through the fleet training course (for your company). GetDefensive.com Support – Customer Service with a Smile! A good course is one thing but what if you have a question? Getting help is easy with the ability to contact them in a variety of ways. As you can see, there are so many ways to get in touch with them that you will never be waiting around to get in touch with someone to help you with any needs that you have. They’re also lightning fast to respond to any way that you contact them. Not only that, but their customer service is so friendly, which really helps out a lot when you’re having to do a mandatory defensive driving course. 100 percent online – this is quite possibly the most useful aspect of any course, and especially this one, since the content is laid out so clearly and efficiently. Since the course is online, you can finish it during your lunch breaks at work, take it all in one sitting from the comfort of your home, or start and stop as you need. The fact that these courses are online also make it convenient because you don’t have to go sit in a traditional classroom environment somewhere and take all of your precious time out of your schedule to knock it out. Ticket dismissal – it’s happened to most Americans; you see the red and blue lights behind you, and you look at your speedometer. Oops! It’s likely going to be a speeding ticket, or maybe even another moving violation, such as the famous ‘California Roll’ where you don’t actually come to a full stop at a stop sign. Oops again! 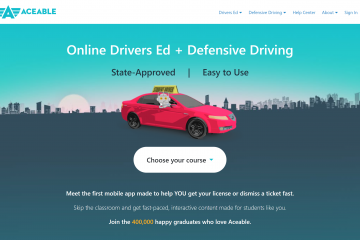 This company’s Ticket Dismissal Course will have you well on your way to get your ticket dismissed, and also to help keep the violation off of your driving record. 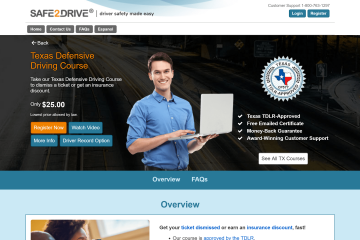 The state of Texas requires that a defensive driving course has to be over 6 hours long, and this course is exactly that. However, it also has fun and engaging content, which makes it seem like you’re spending almost no time at all. In fact, you might not want to go back to work after your lunch break, but instead keep progressing in this course since there is an addictive sense of progress! Insurance Discounts – with their Defensive Driving or Ticket Dismissal Course, you can also qualify for a discount on your insurance premium. Who doesn’t love saving money? The discount is usually ten percent, which will add up very quickly! The course will pay for itself in virtually no time. It is advised, however, that you first check with your insurance company or insurance agent to ensure that you qualify for a discount on your insurance. 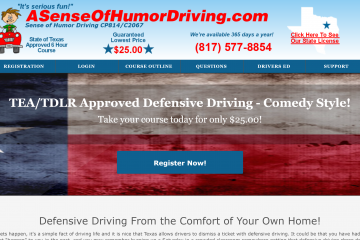 Lasting Knowledge – in addition to all of the tangible benefits you will receive from this course, you can’t beat what they offer underneath all of these things, and that is a quality education from people who care about educating you to be a safer driver for your family, friends, and your fellow Texans. There’s nothing that Texans value more than their families, friends, and fellow citizens. The roads can sometimes be a scary and dangerous place, so learning to drive safely might just save your life or someone else’s life someday! Signing up for this course is extremely easy, and only requires basic information. Once you go to the course registration page you will be prompted to select the reason you are taking the course from the list. You will need to add your name, email, phone number, and credit card information for course payment. Once you start the course, you will see just how simple it is, and leave with a lifelong knowledge of not only how to watch for dangerous drivers, but to be a better driver yourself! Part of a large network of brands that offer a variety of courses for drivers. Many online reviewers have stated that while the site looks updated from the outside, the actual courses are on a much older style site. It appears that this company will need a more extensive review based on other reviews found online. The testimonials listed on GetDefensive.com were last updated nearly 4 years ago even though the site itself was redesigned in the last 12 months. 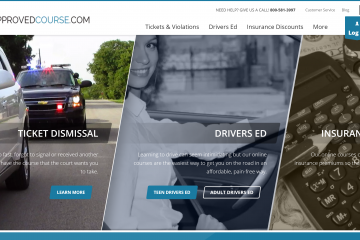 They are still a licensed provider in the state of Texas and had just over 6,000 people complete their course for ticket dismissal in 2018.